The potential for flooding is a common hazard near shorelines and rivers. 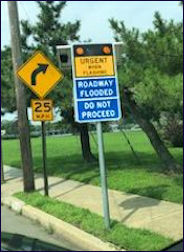 Shoreline community Long Branch NJ uses several Flashing ALERT Signs (like the one pictured below) to alert motorists to the danger, as they approach low areas that are prone to rising water. Beacons are triggered via UHF/VHF. Solar panel and electronics are behind the sign panel. Traffic sees the sign panel with embedded LED Beacons. See a story of creative sign creation/use in volcanic lahar country. Ultra-visible from more than 1000 feet – even in daytime – Flashing ALERT Signs grab attention with their bright embedded flashing LED beacons. Communities, military bases and industries often use the signs in conjunction with Information Radio Stations to announce urgent message broadcasts. But the signs may also be used independently, e.g., to announce detour routes and emergency actions when beacons activate. Flashing ALERT Sign Systems may be custom designed for each application with varying power and control methods, sign text, colors and mounting styles and may be installed apart from electrical power services, which keeps installation costs low. System operators trigger beacons to flash via one of a number of wireless control methods, e.g. UHF, VHF, paging, SMS/cellular, wireless modem. Bright, amber LEDs command immediate attention when activated. When beacons are off, colored panels display 24/7. Flashing ALERT Signs store enough flash-power to run 4 to 10 days even with no sun. With as little as 1.5 average sun hours per day, each sign's backup battery system remains fully charged around the clock. Within each sign location, up to four Flashing ALERT Signs may be connected to and controlled by a single Remote Control Power Unit via wire line. For example, two Flashing ALERT Signs could be placed on a busy thoroughfare, one facing each traffic direction; another pair could be placed on two busy streets that intersect that thoroughfare. Typical size: 44” high by 24” wide, customizable (price relates to size). Composition: natural aluminum, standard 1/16” gauge reflective black/ yellow/blue, high intensity prismatic sheeting; customizable black/white, 2” and 3” high lettering. Mount: universal L-bracket for banding, bolting to existing poles or posts. LED beacons: 2, amber, weatherproof LED beacons; 41 diodes each; 4.25” diameter embedded reflectors. Flash controller: 8A, 50/60 fpm, waterproof. Operation time: 2-4 day flash via solar power without sunlight. Size: 20” high x 16" wide x 10" deep. Construction: NEMA4X, natural aluminum, single-hinge door, hasp-lock-in closure; weatherproof external antenna connector, wiring, ports. Mounts: external tabs for universal mounting to existing poles or posts. Solar panel: typical 40-watt, 2.40-amp at 12-volt DC, 38.38"x12.13". Solar panel mount: side-of-pole, band or bolt-on. Solar controller: 6-amp current capacity, LED charge indications. Battery: 55AH, AGM, sealed type. Capacity: up to 4 flashing signs. Control wiring: #14 AWG, each a maximum of 1000 feet from the controller. Receive frequencies/ranges: 33-50 MHz (VHF low), 150-170 MHz (VHF high) and 450-470 MHz (UHF). Control codes: up to 6 simultaneous codes. Code formats: DTMF (up to 12 digits); 2-tone sequential, single-tone 0.3-3.0 kHz. Programming output: SPDT relay with programmable timer; laptop programming via RS232 port and Windows-based software. Indicators: “ALERT received” LED indicator. Test diagnostics: built in with LED indicators. External antenna: 50-ohm BNC connector. Customized Flashing ALERT Signs may retrofit existing warning/evacuation signs to notify drivers when an event is imminent. Applications include weather emergencies and evacuations. 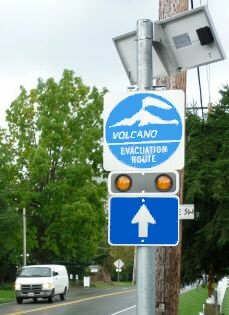 Evacuation signs without flashers tend to blend into local environments, especially for residents and regular commuters, but get noticed with flashers activate during crises. Bill Baker can provide a formal quote based on your application. An illustrated instruction manual comes with the product. We offer technical support for the life of the product 24/7.